Change is not easy to do. Recently I decided to make a reasonably big change with my business and redo my website. I will not only be getting a new design and updated content, but I will be adding some new offerings and updating old ones. Yesterday, as I was thinking about creating this new blog post and thinking about the topic, the idea of making change came to me. Change is not easy to do. Sometimes recognizing a need for change can really require deep personal work. Often the biggest block to making a change is in recognizing the need for change. For me it was deciding that, though my website was updated only a couple of years ago, it is in need of a revision to keep up with the changes with my business and the changes in marketing. That was not too hard to do. But sometimes recognizing a need for change can really require deep and honest personal work. That can be the case with a need for changes in all areas of life including in riding. Maybe there is a deep fear of something, a need to always be perfect, a stream of negative self-talk or maybe an unwillingness to take responsibility for success. Whatever it may be, you first need to acknowledge what is blocking progress and then make a plan to create some change in your life. Then the hard work continues. Because as much as we may want to move forward and do things differently, it often seems easier to just stay the same and stay in that proverbial “comfort zone.” That has been something I have been dealing with since I decided to change my website. It is going to take me time and money to get this done. I could just as easily leave it alone and keep doing as I have been doing. Life in the short term would seem so much nicer. But without that investment of time and money now, I will not make the progress I would like and keep growing my business. That could be okay too. It is a choice I made to make this change and it could as easily be a choice not to. What do you choose and how is what you are doing now serving you? I often ask clients who ride with me the following questions when they struggle to make a change and become resistant to doing so. “It is your choice make the change. What do you choose and how is what you are doing now serving you?” That puts the responsibility in their hands and makes them really think about where they are and if they want to make a change. Usually they decide they do and they begin to take action. That is when a plan is made with strategies to help them move forward and benchmarks created along the way. As their coach, I help them with the accountability part and I support them when there are bumps in the road. It is hard work to create a change in your life, your riding or your business/career. But it is well worth the effort. As I write this I am reminding myself that all of this work on my website will be well worth the effort as well. So, I am off to continue my hard work on that. I hope to be able to share it with you soon! What do you want to change and what is your plan? I would love to hear all about it!! 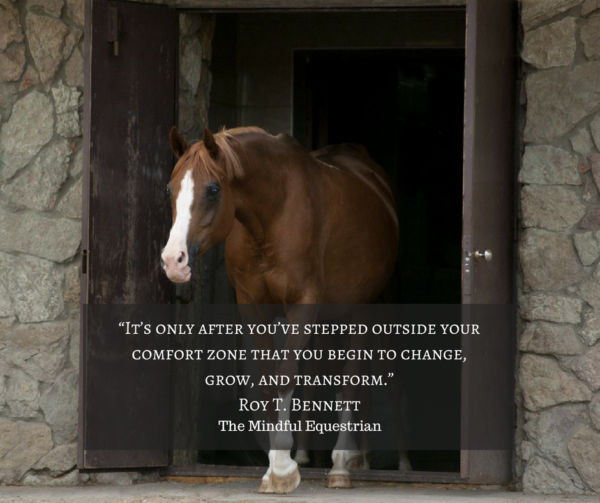 I recently heard from a former student, who is now a trainer, as to some struggles she is having with riders on her interscholastic team around improving their riding. Her problem is she sees them only once a week and that is in a group lesson. Some compete at the more advanced levels but they really need to improve their riding skills. She told me she works hard and offers all types of feedback but they are not really improving. “You can only do so much in a short session and sounds like you are doing as much as you can. I think I would place the responsibility for improvement in their hands. Maybe sit them down and have them create an intention as to what it is they want to accomplish in the long run. Then ask them what things they could do to make that happen. Have them create short term goals to their long term intention. Intention is about purpose. Ask them how they want to come to the table as riders. They have to do all of the work between lessons to improve and build on what you tell them. You can have them analyze, honestly, but without self-judgment, why they are not doing well at the shows and why others are. Then have them take responsibility in making the necessary changes to accomplish their goals. They can mindfully practice between lessons, read books and watch all sorts of videos of great riding in order to improve. 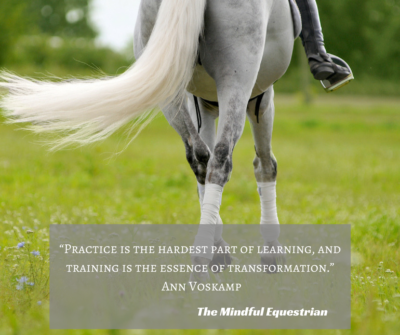 I have often had riders come to lessons with no improvement because they did not put in the work in between lessons. All they would do is WTC around the ring with no purpose in their daily rides. I got over being frustrated by this by telling them it is their choice to improve and asking them what they choose to do. When they decided to come to the table willing to do the work I would help them lay out a plan to reach their goals. The reason I am sharing this that we all need to come to the table with an intention for what we want to be and where we want to be. Then we need to lay out that plan and do the work. We can have wonderful teachers and they can be great inspirations. But, if we don’t put in the effort and do the work it doesn’t matter how much knowledge you have. The knowledge you have must be applied, practiced and developed. Meditation and mindfulness are called practices for that reason. It is the student’s responsibility to study, do the work and come to the “mat” daily and practice. It’s no different in riding. So, here’s to a good daily practice!